Mandoli and for Jr Residents on 18-01-2018 at Tihar and 25-01-2018 at Mandoli. Candidate age should be 30 years for Junior Resident post and 40 years for Senior Resident posts. Interested candidates have to fill the application and submit at the time of Interview. 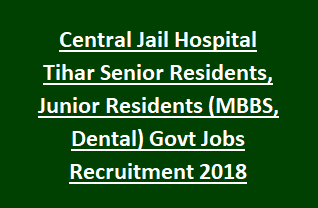 Interview Venue, required Documents to be submitted at the time Interview, Pay Scale, Qualification details of Central Jail Tihar Recruitment of 82 Sr Residents, Jr Residents Government Jobs Walk in Interview are available in the Notification. Walk in Interview date for Sr Residents: 17-01-2018 at Tihar & 24-01-2018 at Mandoli. Walk in Interview date for Jr Residents: 18-01-2018 at Tihar and 25-01-2018 at Mandoli. Total available vacancies in Central Jail Tihar Recruitment are 82 posts. 1. Sr. Residents: 24 posts. 2. Jr. Residents (MBBS): 53 posts. 3. Jr. Residents (Dental): 05 posts. Pay Scale for Sr Residents is Rs. 67,700/- plus Allowances. Pay Scale for Jr Residents is Rs. 56,100/- plus Allowances. Age limit for Sr Residents is 40 years and for Jr Residents is 30 years as on date of Interview. Relaxations for SC/ ST candidates is 05 years and for OBC candidates is 03 years. Sr Residents: MBBS Degree with PG Degree/ Diploma/ DNB in respective discipline from recognized university/ Institutes. Jr Residents (MBBS): MBBS Degree from recognized University/ Institutes and having Internship completion certificate. Jr Residents (Dental): BDS Degree from recognized University/ Institutes and having Internship completion certificate. Candidates will be selected for Senior Residents and Junior Residents Jobs will be based on Walk in Interview. Interview date for Sr Residents is 17-01-2018 at Tihar & 24-01-2018 at Mandoli. Interview date for Jr Residents is 18-01-2018 at Tihar and 25-01-2018 at Mandoli. Prison Head Quarter,Near Lajwanti Garden Chowk,Janak Puri,New Delhi-110054. Office of the DIG (Mandoli),Central Jail Mandoli,Mandoli Delhi-110093. Registration time will be from 10:00 AM to 11:30 AM. Interested candidates have to submit the applications for Jr Residents, Sr Residents posts along with required documents at the time of Interview.